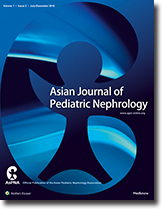 Acute kidney injury (AKI) is very common in children admitted to pediatric intensive care and affected children are at increased risk of morbidity and mortality. The epidemiologic characteristics of children with AKI have not been well described in children living in the Kingdom of Saudi Arabia (KSA). This review of the epidemiology of AKI in critically ill children in KSA shows that AKI is common in this population and is chiefly attributed to sepsis, other infections and postcardiac surgery. The occurrence of AKI is linked to increased mortality and length of hospital stay. The severity of AKI correlates with increased inhospital mortality as well as risk of mortality after discharge. A considerable proportion of survivors develop evidence of chronic kidney disease. Cystatin C and urinary neutrophil gelatinase-associated lipocalin are useful in enabling early diagnosis of AKI in critically ill children. Nephrotic syndrome (NS), a common childhood kidney disease, is associated with significant morbidity and mortality due to disease complications. Most patients who respond to corticosteroids show a relapsing course that requires repeated courses of therapy, and frequent relapses or steroid dependence are common. Most children with steroid-sensitive relapses show minimal change disease upon biopsy. 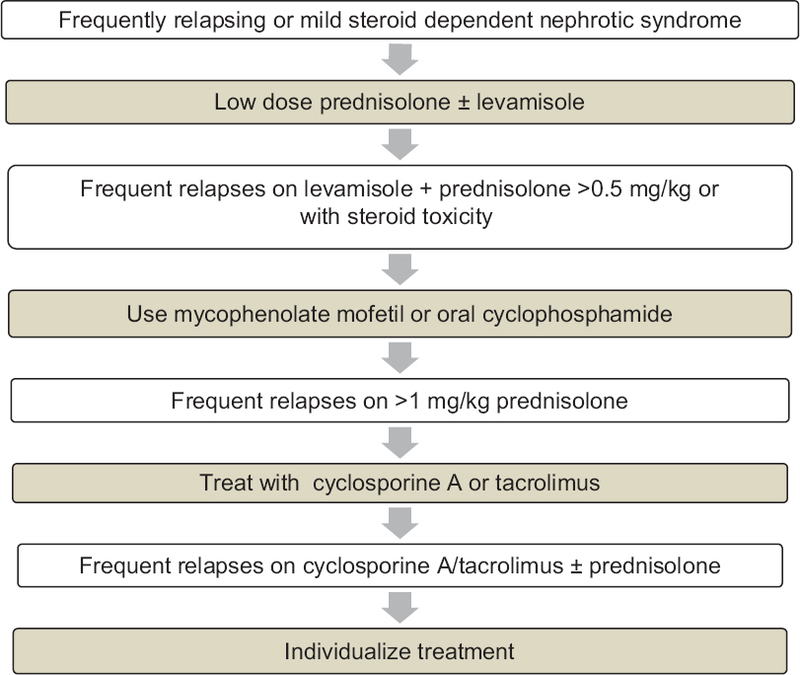 Focal segmental glomerulosclerosis is the predominant histology in patients with steroid-resistant NS where renal biopsy is recommended, and a complicated disease course is anticipated. Patients with frequent relapses are at risk of severe infections, thrombosis, and hypovolemia and receive repeated and prolonged courses of prednisolone that often result in corticosteroid toxicity. These challenges have led to the use of numerous corticosteroid-sparing agents or regimens to reduce the risk of relapses as well as cumulative corticosteroid burden. This review discusses therapy-related aspects of steroid-sensitive NS and compares different regimens of corticosteroid and other immunosuppressive medications that are used in managing this condition. Objective: The survey was conducted to identify current renal biopsy practices in India and compare them with the British Association of Pediatric Nephrology (BAPN, 2015) standards. Methods: A 53-question survey questionnaire was sent to 48 centers across the country by electronic mail. Questions included were related to the number of biopsies performed, indications, prerequisites and procedure of biopsy, monitoring, and complications. The results were compared against the BAPN 2015 standards. Results: Thirty (62.5%) out of 48 centers responded to the questionnaire. 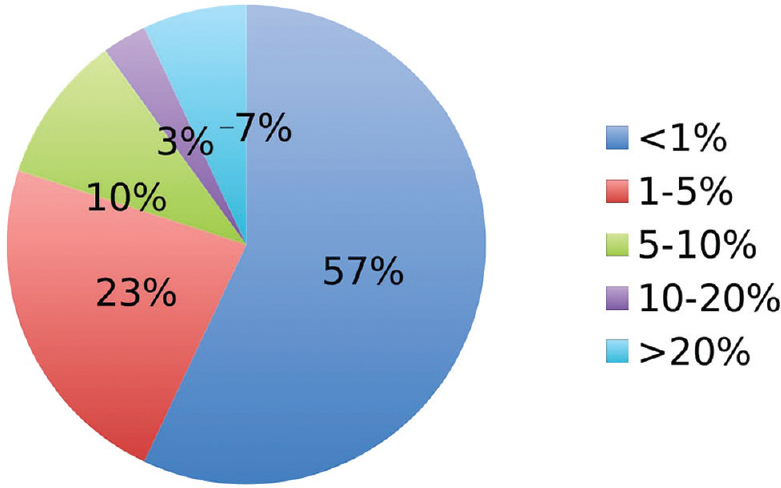 Real-time ultrasound was the favored method at 24 (80%) centers. Most (80%) of the biopsies were performed by nephrologists alone. The biopsy was usually (80%) an inpatient procedure with overnight hospitalization; 20% of the centers performed it as a day-care procedure. The 18-gauge needle was preferred by 60% of the centers. Biopsy was achieved with three or fewer passes in 93% of the centers. Almost half (47%) of the centers considered 10 or more glomeruli on light microscopy as adequate to reach a diagnosis. The rates of gross hematuria were <5% in 80% of the centers surveyed. Death following biopsy was reported by two centers. Conclusion: Majority of the centers surveyed across India achieve BAPN standards in most parameters. Such audit of practices against the standards for kidney biopsy enables comparison between units as well as for monitoring of individual center's performance over time. Introduction: 25-hydroxyvitamin D (25OHD) deficiency is common in children with chronic kidney disease (CKD) and can affect bone mineralization and cardiovascular morbidity. It is important to treat 25OHD deficiency appropriately in a manner that ensures not only replenishing stores but also sustaining adequate 25OHD levels without causing toxicity. 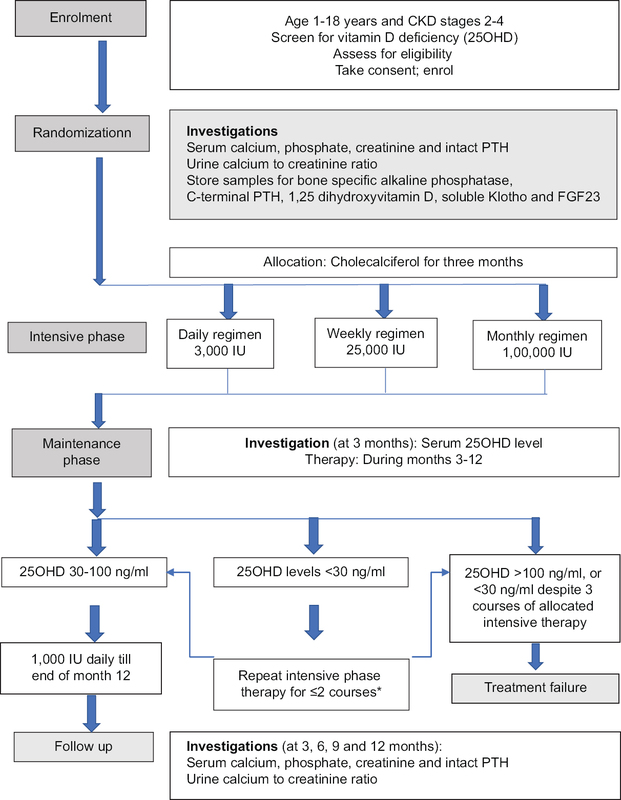 The present study was planned to determine the appropriate dosing regimen for oral cholecalciferol that achieves and maintains normal 25OHD levels in children with CKD stage 2–4 and to assess the effect of various dosing regimens on bone biomarkers, secondary hyperparathyroidism, and vitamin D toxicity. Methods: We present the design of an open-label, multicenter randomized controlled trial conducted across four pediatric nephrology centers in India. Children in CKD stages 2–4 with 25OHD levels <30 ng/ml will be randomized to one of three therapy regimens for oral cholecalciferol (3000 IU daily, 25,000 IU weekly, or 100,000 IU monthly) given for 3 months, allowing an equivalent cumulative cholecalciferol dose in all arms over this intensive replacement therapy phase. After 3 months, patients with 25OHD levels ≥30 ng/ml will continue on maintenance therapy, administered at 1000 IU cholecalciferol orally daily for 9 months. Outcomes include the median change in the level of 25OHD from baseline to the end of intensive phase; proportions of children in each limb that attain and maintain normal 25OHD levels after intensive replacement and maintenance treatment; the change in levels of bone biomarkers and the incidence of adverse effects with each therapy regimes. Conclusion: The study design of a multicenter randomized controlled trial in children with CKD is described. Trial Registration: Clinical Trials Registry of India; www.ctri.nic.in; CTRI/2015/11/010180. Background: The long-term outcome of childhood steroid-sensitive nephrotic syndrome (SSNS) needs further evaluation. In this study, In this study, we report the long-term outcome of childhood SSNS at our center. Patients and Methods: This is a retrospective review of cohort of children with SSNS followed by cross-sectional follow-up evaluation. We included all children aged ≥16 years with a history of childhood SSNS. Of 45 children diagnosed with SSNS and contacted for follow-up, only 9 children were available for evaluation of long-term outcome. Demographic, socioeconomic, and disease history data were collected through a questionnaire. All the patients were examined and had their urine and blood samples collected for investigations. The data were analyzed using SPSS. Results: The mean age at onset for the 45 children was 7.3 ± 3.9 years. Follow-up revealed that 65.1% had frequent relapsing or steroid-dependent nephrotic syndrome and 34.9% had infrequent relapses. Of nine patients were included in the follow-up study for a median (range) duration of 11 (5–18) years, 2 of the patients were relapsing at the time of the study and two had one or more relapses during the previous year. Estimated glomerular filtration rate (eGFR) declined in two children and the mean eGFR for the whole group was lower at the time of last follow-up than at baseline (P = 0.032). Conclusion: Children with SSNS need careful long-term monitoring of disease activity and kidney function. A larger prospective study is required. Background: Dense deposit disease (DDD), a subtype of C3 glomerulopathy, is a rare disease that occurs secondary to hyperactivity of the alternative complement pathway. Renal biopsy typically reveals electron-dense deposits in the glomerular basement membrane. However, treatment options are limited. Till date, to the best of our knowledge, no evidence exists for specific treatment influencing the disease course. Eculizumab, a monoclonal antibody, has been reported to prevent membrane attack complex formation by binding to C5 and leads to improvement in clinical findings. However, the number of reported cases in which eculizumab was administered, particularly in children, is limited. Subjects and Methods: In this report, we present our experience with three pediatric cases of DDD receiving eculizumab treatment. All three patients were diagnosed with DDD on kidney biopsy. All patients showed acute kidney injury, high blood pressure, proteinuria >1 g/day, and decreased C3 levels. Immunosuppressive therapy, which included high-dose methylprednisolone, prednisolone, mycophenolate mofetil, or plasma exchange (in the third patient), as well as antihypertensive drugs, was administered to all the patients. Eculizumab treatment was initiated early in two patients but was initiated later in the third patient, who underwent dialysis initially. Results: The two patients with early initiation of eculizumab treatment showed significant improvement of proteinuria and renal function within weeks of treatment. C3 levels were normalized in one patient but remained decreased in the other. The third patient showed no response. She ultimately progressed to end-stage renal disease and eventually needed maintenance dialysis. Conclusions: Early initiation of eculizumab was associated with decreased proteinuria and improved renal function in two patients. These findings were in agreement with previous reports on the beneficial effects of eculizumab in DDD patients. Nephrogenic systemic fibrosis (NSF) is a rare complication following exposure to gadolinium-based contrast media. Gadolinium-based contrast agents (GBCAs) are widely used for imaging throughout the world. 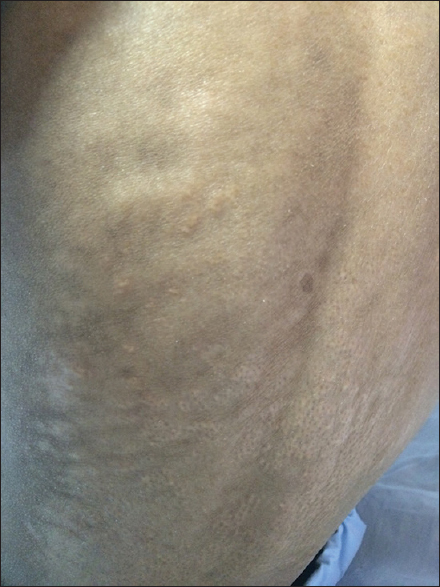 NSF, formerly known as nephrogenic fibrosing dermopathy, is a rare progressive fibrosing disorder associated with administration of GBCA in patients with severely compromised renal functions. The condition is well reported in adults, but pediatric cases are rarely reported. Out of 1280 cases in the literature of NSF associated with GBCA, only 12 were found in the pediatric age group. We are reporting a pediatric case of a 7-year-old child with chronic kidney disease Stage VD, who developed NSF following magnetic resonance imaging. A 5-year-old girl presented with a history of bilateral reflux nephropathy and a left kidney mass, suspicious of Wilms tumor on imaging studies. She underwent radical nephrectomy according to the National Wilms Tumor Study protocol. The pathology report was consistent with metanephric adenofibroma (MAF), for which radical nephrectomy was considered curative. MAF is a benign, uncommon tumor, which is frequently confused with Wilms tumor on diagnostic imaging; histopathologic studies reveal the diagnosis. The diagnostic and management approach to MAF is discussed. Severe hypertension in children is chiefly renal parenchymal or renovascular in origin. Renovascular hypertension is usually symptomatic and rarely presents with renal tubular dysfunction. We describe a 2-year-old child with polyuria, failure to thrive, hyponatremia, hypokalemia, metabolic alkalosis, hypercalciuria, low molecular weight proteinuria, and medullary nephrocalcinosis. Evaluation revealed severe hypertension and discrepant renal sizes. Doppler ultrasonography and digital subtraction angiography showed right main renal artery stenosis. Hypertension and electrolyte abnormalities abated following percutaneous angioplasty. Unilateral renal artery stenosis may manifest with symptoms of renal tubular dysfunction alone. Hypokalemia and metabolic alkalosis must prompt consideration of renovascular hypertension and monogenic causes. Angiography is essential for confirmation of renovascular hypertension and enables angioplasty, the mainstay of management. 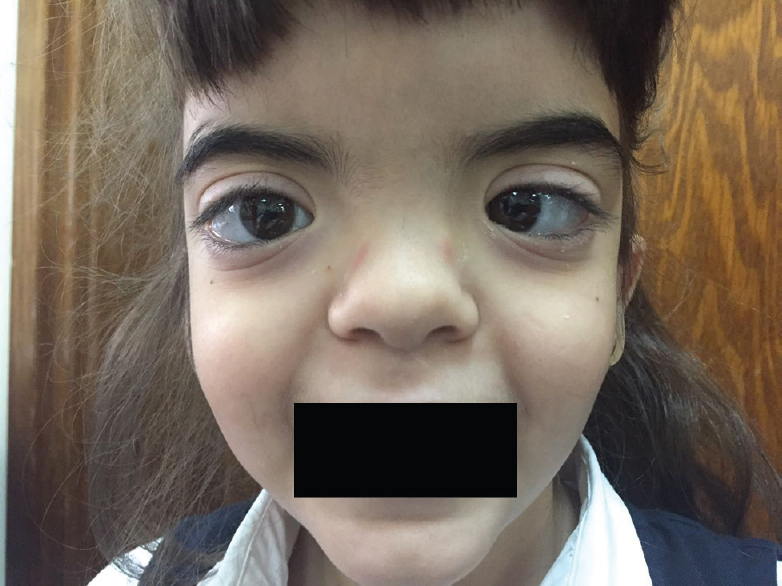 Donnai-Barrow or facio-oculo-acoustico-renal (DB/FOAR) syndrome is characterized by typical craniofacial features, ocular findings, sensorineural hearing loss and agenesis of the corpus callosum along with varying degree of intellectual disability. Renal involvement in the form of low molecular weight proteinuria is commonly reported. We report a case of an 8-year-old girl with DB/FOAR syndrome which was genetically confirmed to have a novel frameshift mutation, c.13139del in exon 72 of LRP2, the gene encoding low density lipoprotein receptor related protein 2 precursor, megalin. The child had chronic kidney disease (CKD) and significant proteinuria with focal segmental glomerulosclerosis on renal biopsy. 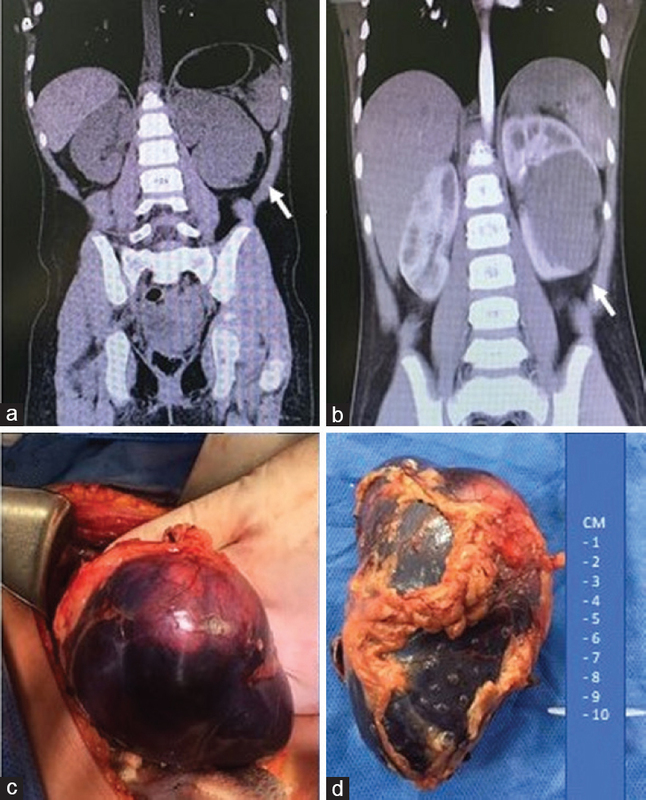 Our case highlights presentation in childhood with this rare syndrome, with significant renal involvement as nephrotic range proteinuria and CKD. Children with DB/FOAR syndrome need close follow up with nephrologist. Antiphospholipid syndrome (APLS) is a systemic autoimmune disorder characterized by venous or arterial thrombosis in the presence of persistent laboratory evidence of antiphospholipid antibodies. We report a case of a previously healthy, 14-year-old boy, who presented with abdominal pain and headache for one day. 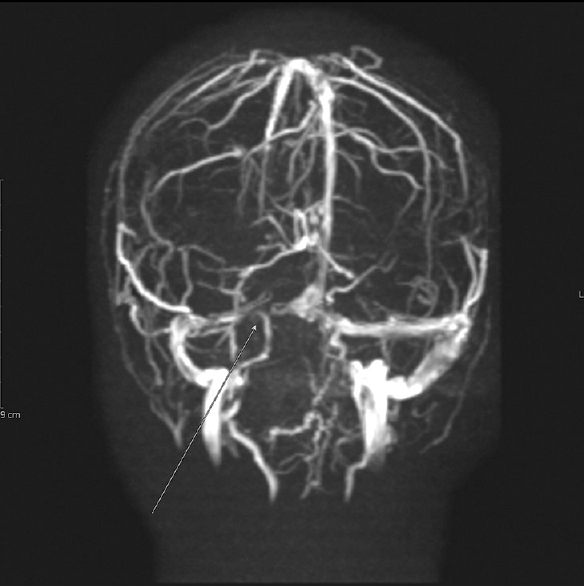 Magnetic resonance imaging of the brain revealed sinus venous thrombosis and multiple areas of arterial and venous infarction. Computed tomography of the abdomen showed smaller right kidney with multiple wedge-shaped non-enhancing cortical areas of renal infarction. A diagnosis of APLS was made following demonstration of antibodies to cardiolipin and beta-2 glycoprotein, and the child was managed conservatively with antihypertensive agents, anticoagulation, and immunosuppressants. Follow-up imaging after one year showed resolution of cerebral thrombosis and improvement in renal functions.